Spawned in New York by host Todd Zuniga, Literary Death Match shakes up erudition and silliness cocktail style, luring the young and trendy out by mixing good and geeky times with the literary, light and louche. We returned for Episode 7 to see how London has taken to LDM. Bunkered down in Concrete on Wednesday night it wasn't until Simply Red came on that we twigged the theme of the evening. Apparently we're so innured to 80s fashion round Shoreditch that puff ball dresses and Miami Vice jackets fail to register as '80s themed'. Sponsored by Picador and promoting Brett Easton-Ellis' latest, there were considerable plugs for the novel including a Rubiks cube twist off for a signed copy.Literary Death Match pits writers (representing publishers or literary concerns) reading 7 minutes of their own stuff against each other, judged on literary merit, performance and intangibles by a 'celebrity' panel who are encouraged to be funny. There's a seesaw of erudtion and gameshow anchored largely in the latter camp by hosts, Todd Zuniga and Nicki Le Masurier.Proceedings kick off with an ill prepared Milly McMahon of i-D Magazine wearing nothing but a t-shirt and stumbling over an old blog post about losing her virginity. Happily, Clare Pollard follows with 3 knock out poems, articulate and thought provoking, particularly when talking about gangs on the streets of Dalston without patronising or stooping to cliche. Judging deems Clare the round 1 winner, though why they need to confer at all escapes us.Round 2 sets Nikesh Shukla's excellently amusing extract from his book, Coconut Unlimited, about pubescent adventures in rap music and how to speak Gudjarati head to head with the painstaking descriptiveness of Lee Rourke's games of teenage Pong from his novel, The Canal. Surprisingly, the judges go with Rourke, a close call given the quality writing.What next in this fight to the literary death? Obscure lit pop quiz? A word off or sonnet smackdown? Nah. The audience splits into two camps to guess the 80s pop star on behalf of the finalists. Rourke wins but but it hardly seems to matter.LDM is a popular and fun platform for publishers to reach the young and switched on but there's space in the format for more seriousness. With less insistence on having a good time, a bit more lit and a bit less loud, a better might be had by all. 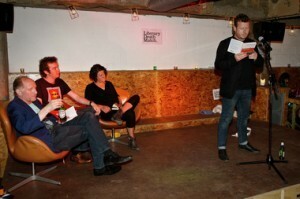 That said, kudos for putting Simon Hickson on the panel, even if he looked - like us - slightly bemused throughout.Literary Death Match returns to Concrete on August 11th from 8pm. Get there early to get a good seat.